The Universal Laws describe everything as energy. Everything that you see is not solid; atoms which were once considered as the smallest things that ever existed are in turn made up of subatomic particles of energy or light which have no solidity at all. Science tells us they are quite literally, packets or waves of information that vibrate. This vibration is produced in the form of amplitude and frequency; oscillations that generate more energy. So your hand or the chair that you are sitting on is nothing but energy and information. The concept of the Universe existing as light energy is not a new idea. New science is now indicating how it is possible through the understanding of quantum physics. Most of us have heard about the law of attraction and probably watched movies such as The Secret1 or What the Bleep2. Self help books like The Power of Positive Thinking3 by Norman V. Peale have also been available for decades. Why is it then, so many people have trouble creating abundance in their life? I often hear “yes I understand, but it doesn’t work for me!” What you fail to realise is that, it is working! The Universe always gives us what we focus on because the Universe is based on some fundamental rules. These are rules of energy or vibration and are commonly referred to as "Universal Laws." Once you understand these laws, you can apply them to change your life. This thinking and wisdom was known long before The Secret or any New Age movement for that matter. We are simply coming full circle because we are now beginning to realise how it may be possible or true. If we accept these Universal Laws, we begin to understand how energy healing is possible and how we create the world around us. 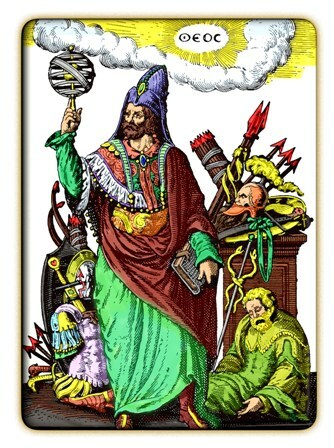 Hermes Trismegistus is called The Father of Occultism, the founder of Astrology, the discoverer of Alchemy, the Master of all Masters. From ancient Egypt have come the fundamental esoteric and occult teachings which have so strongly influenced the philosophies of all races, nations and peoples, for several thousand years. Egypt, the home of the Pyramids and the Sphinx, was the birthplace of the Hidden Wisdom and Mystic Teachings. The modern interpretations of the Universal Laws are based on the study of the seven Principles in Hermetic Philosophy of Ancient Egypt and Greece, first published in The Kybalion in 1908. Of course this knowledge has actually been around since the beginning of time, it's just that us humans are a bit slow on the pick-up. Hermes also known as Thoth, lived in Atlantis and Egypt for over two thousand years, according to the channelings of Djwhal Khul4 and Vywamus5. He was known at the time he lived throughout the world, as the Master of the Masters. Egypt was one of the highest spiritual civilizations that has ever existed on planet Earth, and Hermes played a key role in its flourishing. Hermes was known as Hermes Trimegistus. He was the father of occult wisdom and one of the founders on Earth of astrology and alchemy. The Egyptians were so amazed by the profundity of this man and his teachings they deified him under the name Thoth, and He became one of their Gods. In later times, the civilization of Greece made Him one of their Gods also, calling him, Hermes, the God of Wisdom. He was considered the messenger of the Gods. The term Trimegistus means thrice great. Hermes name became synonymous with the “Fount of Wisdom”. The Hermetic teachings are found in all lands and all religions, because of the universality of its appeal. In early days there was a compilation of certain basic hermetic maxims, axioms, and precepts, which were passed from teacher to student, which is called the “Kybalion” as previously mentioned. The following Universal Laws are the most common interpretation of the seven ancient Hermetic principles. Two other laws have been added which are not directly expressed in the Kybalion. The *law of relativity and the *law of transmutation are not directly described in the Kybalion, but are nevertheless principles of creation and existence. The universal law of relativity is my favourite. Nothing has meaning until you give it meaning. This is very powerful, because you get to decide whether an experience is either bad or good, or means nothing at all. If we accept these Universal Laws, we begin to understand how our lives are manifested by our focus. You see your reality as real because your brain functions as a quantum machine and creates your world through the five senses of sight, sound, touch, taste and smell. It actually transforms and interprets the energy around you much like a hologram, where you can feel and navigate the 3-dimensional effect. YOU are a quantum energy machine, and you create your own world by focusing energy; and remember, thoughts and emotions are also energy. What you believe, think about, worry about and keep talking about is what you create more of. This can be positive or not so positive, depending on whether you are creating what you want, or more of what you don't want. So the question is, what are YOU focusing on? what about Free Will and Intent? Universal laws apply to every thing in every universe, whether you are aware of these laws or not. With regards to Intent, you will manifest whatever you focus on whether it is "perceived" as positive or negative. The key to intent is to remember the law of cause and effect because you will experience what you put out. Setting your Intent is more than being clear on what it is you want to manifest or achieve. Remember that thoughts are also energy and your "true intent" behind any action will be subject to cause and effect. You can't hide your intent and it is subject to the Universal Laws rather than being a law to itself. With regards to Free Will, It was once described to me that, "There is Law and there is the Nature of The Universe. Free Will and Choice are the nature of the Universe." You could argue that Free Will is a basic law, but to me it is more of a "right" than a law governing all things. Everyone has the right to choose, and having made a choice Universal Laws will bring to you the consequences of that choice. Can Free Will be over-ridden? I believe it can in certain circumstances. I explore this more fully in the eBook Being Human:The contract of life. The key to understand is that everything that you experience in life is due to the choices you make. That's the little trick to life we are not told about. If you feel out of control it's because you have given it to someone or something else, albeit unknowingly through some form of entrapment. Once again the Universal Laws come into play to support your choice. You and whoever is controlling you is still being governed by Universal Laws. So yes you have the right to Free Will, but you can lose control of it. Until you understand the Universal Laws and how they interplay to create Lore, you will forever be playing in someone else’s game. This is the concept that has been either lost or deliberately hidden from us. The consequences of the choices we make can cycle throughout eternity until we bring them into balance. That brings us to LORE: Rules to the game of life. 1. The Secret; Prime Time Productions, 2006.